An indicator of drop voltage can be achieved using electronic diagram below. This indicator shows the drop voltage or disturbing impulses of any existing network using a LED which will light. 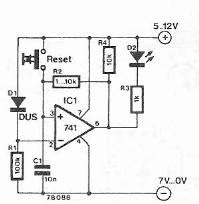 This circuit can be powered with a DC voltage between 5 and 12 volts.